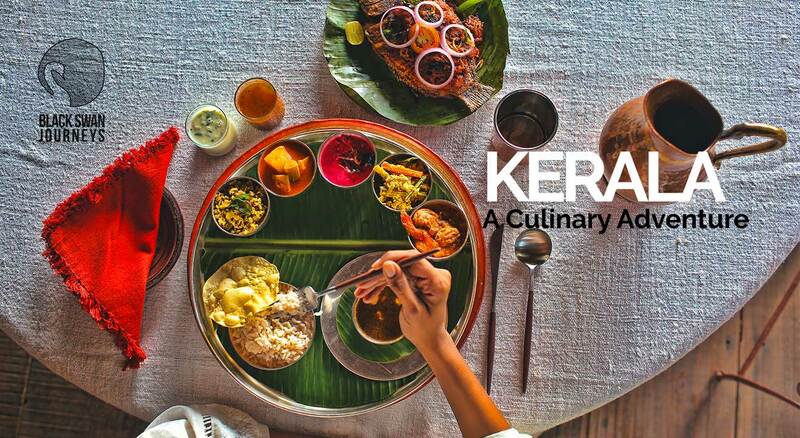 Book tickets to Kerala: A Culinary Adventure! Embark on a culinary adventure as you traverse the spiciest state of India. Kerala is a feast not only for your eyes but also your taste-buds. On this foody adventure, we explore hidden secrets of Syrian Christian cooking, learn the techniques of growing vegetables organically, shop for seafood in Kochi’s fish market and sample a royal Kerala banquet in a restored King’s Palace! While food remains the highlight of this adventure, travelers also get a glimpse of the village life and an insight from the master into the art of Kathakali performance. Welcome to the land of spices, coconuts and backwaters. On your arrival at the airport, you will be received by our representative, who will then assist you to board your transport. A drive of approx. 2hrs takes you to your stay - A sea-side village experience set on 30 acres with coconut groves, lily ponds, fruit trees and a large organic farm. In the evening, head out for the first cooking demo and dive head on into this whilst learning a few harvesting techniques and the use of some of the local spices. Starting late evening, visit the organic farm of the Beach Resort to pick fresh vegetables for the cooking session, get an insight into the many spices used to prepare the menu. Post the class, enjoy your self cooked meal. After breakfast we take a 2-hour drive through green fields. to reach a countryside home of a renowned chef with whom we will part take in a cooking class learning the methods and few dishes of Syrian Christian cooking. Your host demonstrates his culinary heritage by reviving age old grandma’s recipies. This session will also provide expert guidance regarding the varieties of spices, their usage, combination technics, and medicinal value as herbal remedies for minor ailments and preservation methods. Later enjoy the meals you have cooked amidst a beautiful countryside setting. Drive back to your beach side retreat. Rest of the evening you are free on your own to relax and enjoy the beach or indulge yourself in some traditional Ayurvedic massages. If you love nature, join the naturalist at the interpretation center to understand the unique bio-diversity of this region. Enjoy your dinner at the resort. After breakfast, checkout from your beach side retreat. Before we head to the capital we make a stop in the heart of rural Kerala to get a glimpse of village life on the lines of Arundhati Roy’s novel ‘God Of Small Things’. On this 2 hour journey you enjoy a traditional canoe ride through winding canals while catching a glimpse of life along the banks; after you de-board take a guided village walk and then visit a Kathakali master’s house who will introduce you to this traditional theatre form. Post this interaction, enjoy a local lunch and head back towards Kochi. The boutique stay, located in the historic quarter of Fort Kochi is an amalgamation of the architectural splendor of Fort Kochi's colonial past. A former shipyard in the British times it has been converted to a boutique stay with views to match. On arrival, check-in and relax. The evening is free on own untill its time for dinner. Enjoy sumptuous local delicacies and wind up your day watching the lights across the river. Today early morning, accompanied by the chef, visit the local market (fish market & vegetable market) to purchase ingredients for the cooking demo. Enjoy the vibrancy of the markets and polish your bargaining skills. On your return, take part in a demo of local sea-food delicacies prepared by the inhouse chef. Late afternoon, we head out on a brief Historic walk with an INTACH expert to peel the layers of history of the Fort Kochi area. Post the walk, enjoy a spectacular display of martial art form called Kalaripayyatu. Return to your stay and enjoy dinner. Post breakfast, we head out with our guide to explore two main highlights of the Fort Kochi area –Kerala Folklore Museum, the Dutch Palace (Mattancherry Palace), Jewish Synagogue and the Indo Portuguese Museum. Later we return to the pier to take an hour boat ride towards the exclusive traditional lunch experience to Chitoor Kotaram – a traditional stay built by a king for his relaxation. Enjoy a short guided visit to the neighbouring village feel and then explore the royal home of the king, where he sought to take time off his worldly duties. Pay homage to the family deity in the temple nearby. Later we settle down for an authentic Kerala banquet served on banana leaves at this palace. Post this we return to the Kochi hotel. The evening is free on own untill its time for dinner. Day 6 – 17th Aug 2018: Departure (B) Time if free in the morning ill it is time for the departure flight from Kochi. A unique village based experience. Everything, from thatched cottages to the upkeep of the property, echo the simplicity, beauty and harmony that underlie Malabar’s coastal cultures. Nature and wellness are omnipresent at Marari and oversee all your experiences. The thatched roofed cottages are minimalistic and infused with native aesthetics. The bathrooms have been designed to mimic nature as you get to bathe under open skies with rustling leaves, whispering winds and shimmering stars for company. Rooms do not have television connection as the idea is to encourage a connect with nature. Is a restored period building. The erstwhile boatyard started by Geo Brunton in the 19th century was converted to a boutique history hotel steeped in stories of Fort Kochi's colonial past.. The wooden high ceiling, the terracotta floors, lime plastered walls and old teak wood furniture tell the story of Fort Kochi’s colonial heritage. The lounge is reminiscent of the days of the Raj, with its high lofty ceiling and old- fashioned'punkhas'. All the 22 rooms of the Brunton Boatyard overlook the sea as do all their en-suite bathrooms. There are few pleasures to rival that of watching lazy ships and fishing boats or gamboling dolphins while going about your ablutions.